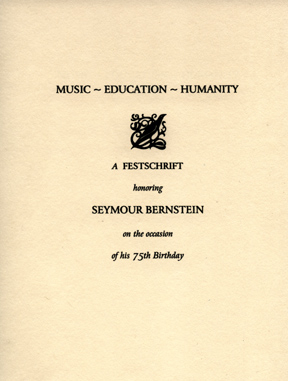 The Festschrift is a collection of articles on music, on piano performance and pedagogy, on study with Seymour Bernstein, etc. Compiled and edited by Birgit Matzerath and Alison Thomas and published in December of 2002, this book has 129 pages, including four pages of color photos. Contributors: Tallis Barker, Mark Cannon, Marcia Eckert, Emily Flint, Calvin Herst, Phyllis Alpert Lehrer, Flora Levin, Birgit Matzerath, Christian A. Pohl, Paul C. Pollei, Gerhard Schroth, Donald Shaw, Paul Sheftel, Richard Shirk, Rebecca Payne Shockley, Joseph Smith, Jean Stackhouse, Alison Thomas, Baylis Thomas, and Elizabeth Wolff. For European orders, please send $11.95 plus $7.00 shipping and handling per copy. For free delivery of orders in New York City, e-mail alison.thomas@verizon.net. For orders in New Hampshire, contact Birgit Matzerath, at birgitnh@totalnetnh.net. A PDF order form is available to download by clicking here. Please include contact information, either e mail or phone, with your order. Thank you!